Are there more refugees now than at any time since World War II? I've always thought this claim seemed dubious, even if one kept in mind the fact that there are more people alive now than at any time since World War II. Intuitively it seems that things like the Chinese Civil War, Indian partition, the Bangladesh War of Independence, and the Vietnam War might have created more refugees at another time. One often hears that we face the largest refugee crisis since World War II. This is actually not true, and leads to bad policy choices. The UN’s total for “forcibly displaced” people includes refugees (who have crossed borders, 19 million as of 2014), asylum seekers (2 million) and internally displaced persons (IDPs, 38 million). Not only are IDPs by far the majority, but they drive the increasing numbers. Refugees themselves totaled 18 million in 1992, dropped to about 15 million through 2012, and recently increased back to 1990s levels because of the Syria war. I'd like an answer to consider both a strict definition of refugee (who must have been forced to cross country boundaries), and also a looser definition which also takes into account internally displaced persons. PEW also has an article on this, and they have displaced population data starting in 1951. Nearly 1 in 100 people worldwide are now displaced from their homes, the highest share of the world’s population that has been forcibly displaced since the United Nations High Commissioner for Refugees began collecting data on displaced persons in 1951. Only for the former category (IDPs) data is available starting just from 1989. The large increase since 2011 is due to Syrians. An there's no huge spike in the above graph in 1989 so the inclusion of IDPs doesn't seem to have created a major distortion as Goldstein claims. In most IDP contexts, no registration systems or other list of the total IDP population exist to enable analysis on their situation. Where they do exist, they are often incomplete due to the high cost of maintaining them up to date, as well as various other reasons that will be discussed later in this article. These gaps, often corresponding to groups likely to be particularly vulnerable, create biases that should be of concern to the humanitarian community. In the absence of such lists in most countries, data on the total IDP population is often not available at all, or consist of a patchwork of estimates from various sources collected for different reasons (most commonly a patchwork of uncoordinated programmatic assessments implemented by different actors, in different but overlapping places and time periods). Some examples of including displacement analysis in the national census or large scale demographic surveys to obtain an overview of the displacement situation exist from some countries, but in general the opportunity for collecting or analyzing information on internal displacement in these processes is rarely tapped into. Hence, most of the time data with complete coverage of the total IDP population is not available. Instead, a sample-based approach is often used to produce data with the objective of generalizing the findings to the total IDP population. Choosing a sample should allow for each individual in the IDP population, be it households or individuals, an equal opportunity to be selected for study. Sample-based methods are often the most cost-effective and feasible for obtaining needed data on IDPs, and – done well – they can produce equally useful information for operational decision-making as data collection with full coverage; a point that is far too often under-valued. Choosing a sample that can produce representative data on the IDP population requires careful planning based on information, at a minimum, on the locations and estimates of the size of the overall IDP population, which can be used as a sampling frame. However, various issues complicate not only the establishment of a comprehensive sampling frame on IDPs, but also collecting data on the situations of these populations in general thus further complicating the ability to produce representative data. Even when relying on a single, supposedly consolidated, source, IDP numbers are likely historically under-reported. Looking at WRS data on Lebanon for 1982-83 i.e. in the middle of the country’s 15-year long civil war, the number of IDPs is placed at 60,000. This figure is hardly believable, given the extensive scale of the fighting since 1975 and that Israel had just invaded the south of the country in mid-1982. In fact, the very next year, WRS’ IDP estimate for the country jumps to 600,000. Similarly, for both Iran and Iraq, WRS estimates of IDPs during the initial years of their bloody 1980-88 war are conspicuously patchy or missing. A frequently cited estimate of the total number of casualties—including those killed and injured—stands at 1 million, for the entire duration of the conflict. Give this figure, one would also expect significant levels of internal displacement to have occurred from the onset along both countries’ border areas. Yet no figures for this are available. Discrepancies in the data become more anomalous when looking at global IDP estimates. A 1991 report commissioned by the UN’s Economic and Social Council, and referenced in later UN documents, estimated the number of IDPs at the time to be 24 million. According to the UNHCR, in 1993–the first year for which the agency has separate IDP figures–the number of IDPs worldwide was just 4.19 million. Let us now assume that both these figures are good approximations. Even if we consider the fact that the UNHCR does not factor in natural disaster-caused displacement, how likely is it that within a span of 2-3 years the number of IDPs actually fell by nearly 20 million? Not very, especially considering the political and often violent turmoil that marked the early 1990s, from Somalia to Afghanistan to the Balkans. So you can either buy or not Goldstein's argument that the number of displaced would have been higher if those uncounted IDPs from pre-1989 conflicts (partition of India etc.) were properly accounted for. As you can see from papers discussing such issues, it's difficult to get trustworthy estimates for IDPs, and even more so for past conflicts. On the other hand, the number of refugees (no IDPs included) for 2016 is only about a 1/3 of that total number (22.5 million out of 65.5 million), so only 0.27% or so, comparable in the graph above with the mid-1980s, before IDPs started to be accounted for. So Goldstein is roughly correct on this issue. Jordan’s sealed borders effectively leave refugees fleeing conflict in Syria with three main options: remaining in Syria, moving into Jordan irregularly or seeking refuge elsewhere, with Europe one major option. To the extent that Jordan’s policies may prompt the first two of these options, there are clear concerns in terms of refugee protection and rights under the 1951 Refugee Convention. However, they could also prompt increased flows to Europe. In the latter case, there is a sense in which European restrictions aimed at reducing flows to Europe have in fact encouraged a Jordanian approach that may in the long term increase the number of Syrians arriving at Europe’s borders. Not the answer you're looking for? Browse other questions tagged refugees . Is Saudi Arabia hosting ~2.5 million Syrian refugees? 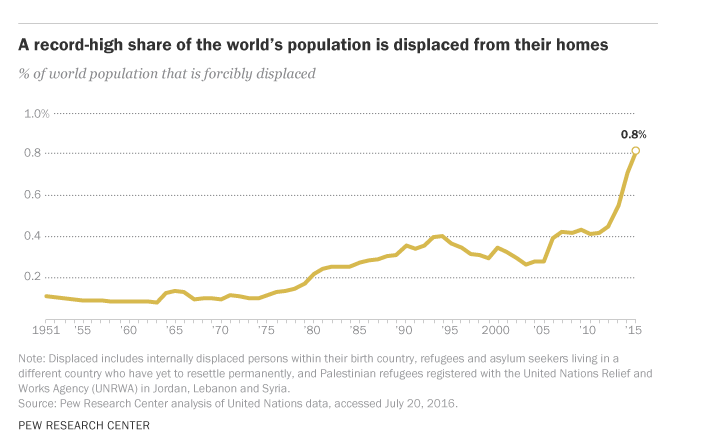 Has Syria received proportionally more refugees than other countries in recent history?